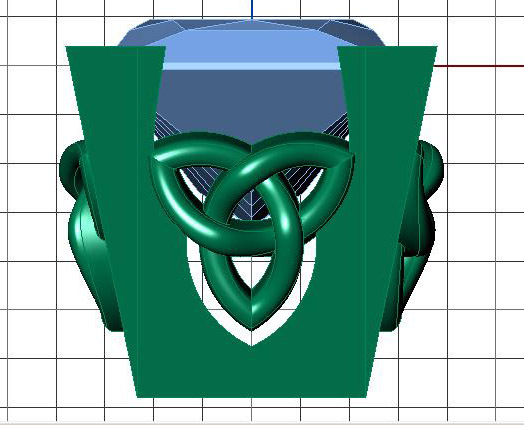 We make every single puzzle ring individually to order. No taking rings off a shelf to send to you! 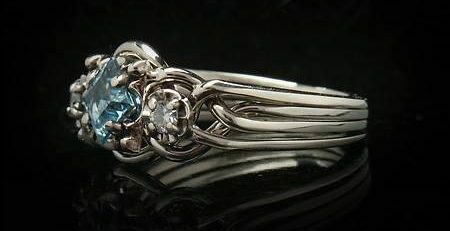 We hand-weave the puzzle ring, we hand-select the stone, and we hand-set the stone so that you will have the most uniquely beautiful engagement ring you could possibly imagine. Choose a half carat round diamond, as shown below, in the Athena style, which features a sturdy, six-prong diamond setting on a four band 14K yellow gold puzzle ring. 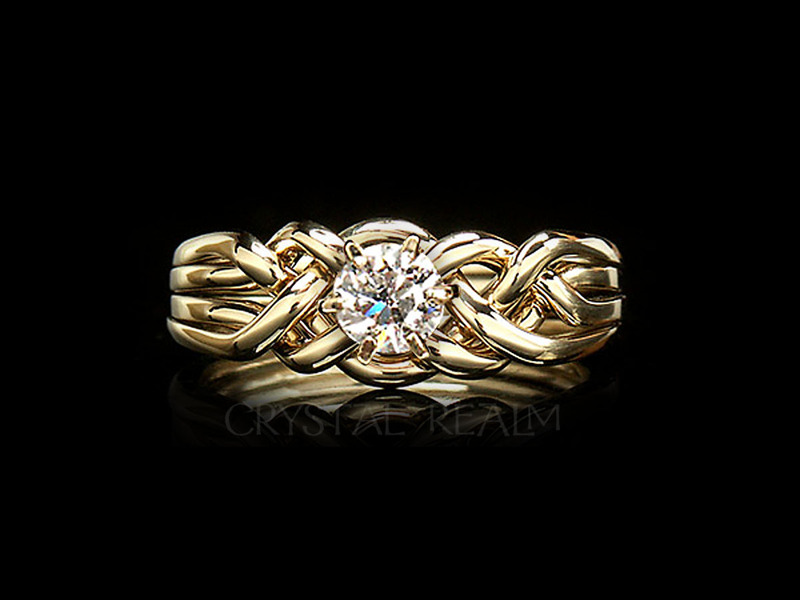 Half-carat diamond four band puzzle ring in medium-heavy weight and 14K yellow gold. Or choose a diamond or moissanite as large as you wish. 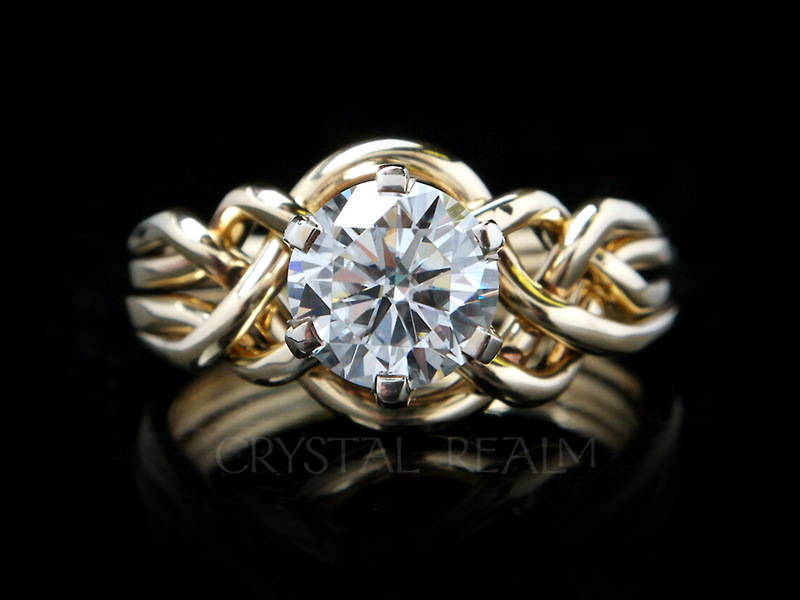 Shown here is a 1.8CT round moissanite also in the Athena style. It’s an 8mm stone. You may select a colored gemstone, if you prefer. And then there is the Avalon style, which features a medium-low, chunky setting, also on a four band or a six band puzzle ring – your choice! 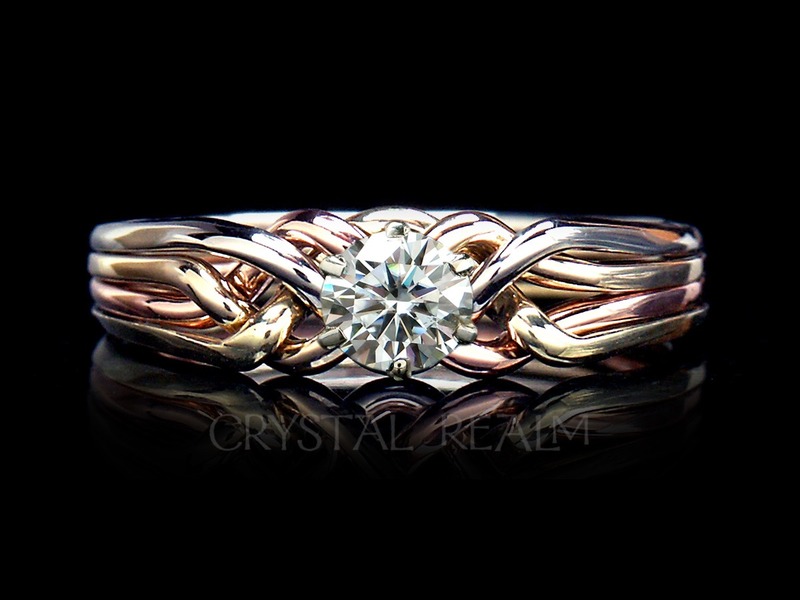 Our puzzle rings are named for the very setting that holds the stone. 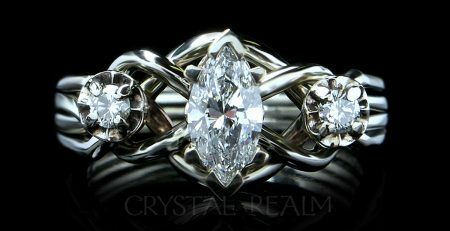 By setting, I mean what is sometimes referred to as a “head.” The Avalon setting can hold a princess-cut or a round stone. Notice how the setting looks a bit like a lotus flower when set with a round stone. 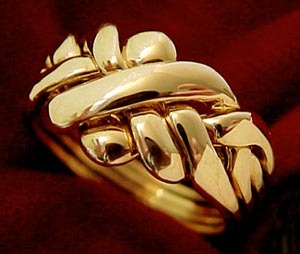 So a medium-weight puzzle ring may be a Guinevere, an Athena, or an Avalon – the puzzle ring is the same, but the head that holds the stone determines the name of the ring. An Avalon, four band puzzle ring shown with a one-half carat round brilliant diamond. 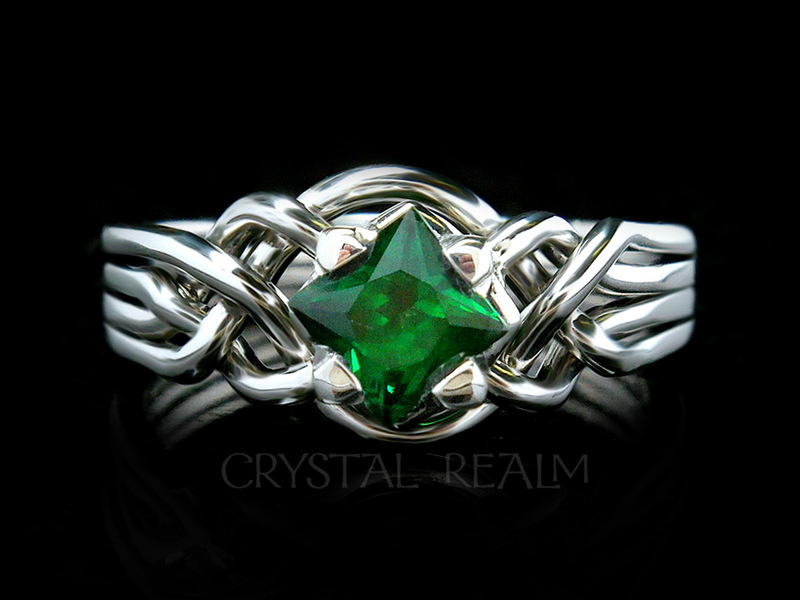 Here is the Avalon puzzle ring with a princess-cut stone. 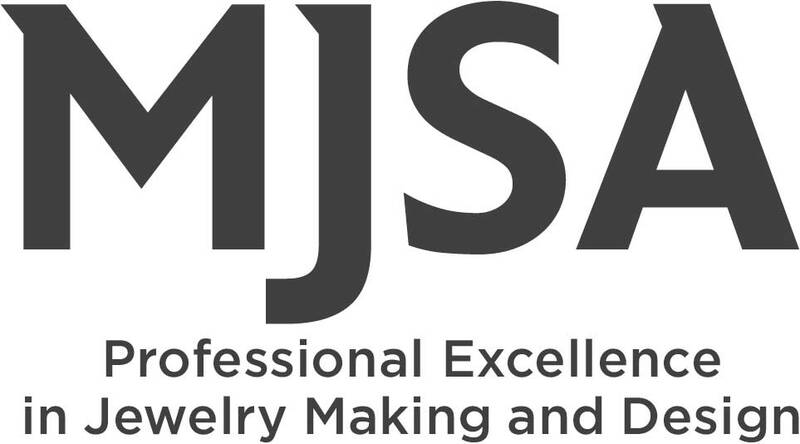 Did you know that colored gemstones are calibrated? This means that each one is cut to a specific size, such as 4mm square, 5mm square, 6mm square. Depending upon the depth of the stone, the carat weight may differ for two stones that have the same length and width. 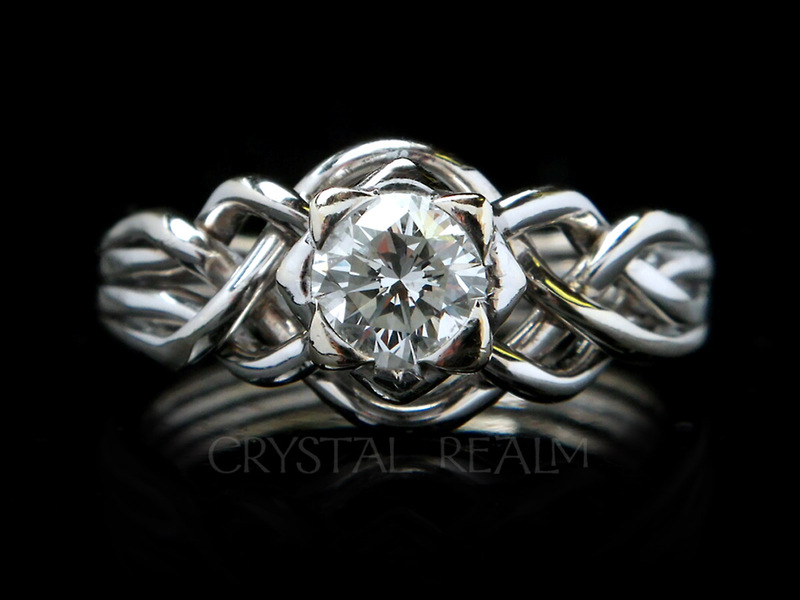 Our medium-weight puzzle rings, shown below, can hold up to a 0.72CT stone. Beyond that, we make the puzzle ring a little or a lot heavier, depending on the carat weight of the stone and your taste. 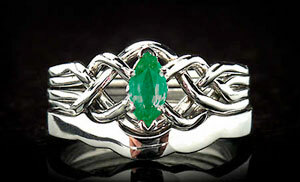 Four band, Avalon puzzle ring with princess cut tsavorite green garnet in palladium. 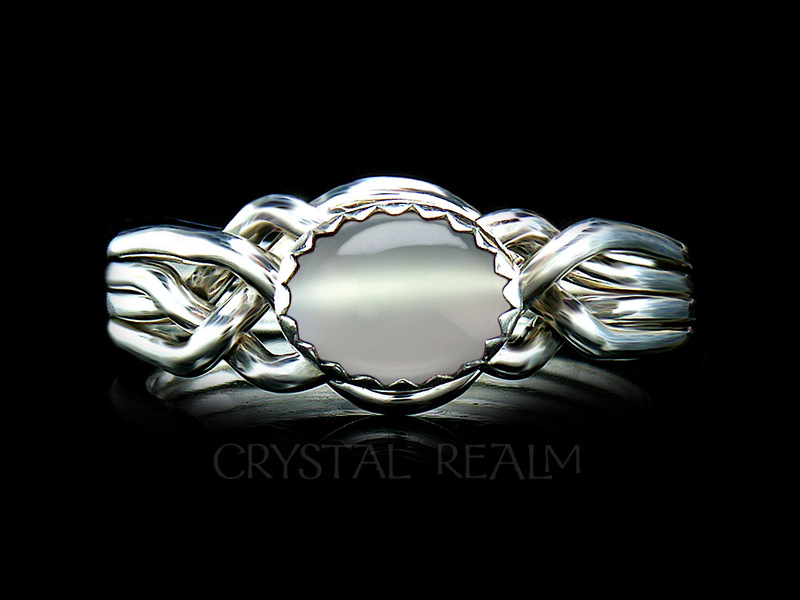 This is a medium weight ring holding a 4.5mm stone.